Alemania- GISMA BUSINESS SCHOOL — Misstudy | Ingresa en la universidad de tus sueños. GISMA Business School offers recognised-accredited degree programmes. 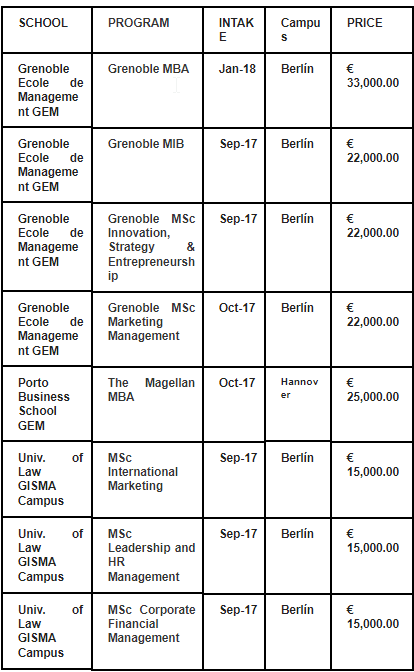 GISMA in Berlin is a joint venture with Grenoble Ecole de Management (GEM). Although located in Germany, courses are taught in English – the world’s foremost language when it comes to business. International MBA students can take the opportunity to attend German language classes as part of their course at no extra cost. Having the necessary language skills will enable them to pursue job opportunities in Germany or elsewhere in Europe. Our alumni, from more than 60 countries, have accelerated their careers in Germany and abroad with a sound foundation in management theory, diverse practical experience. At GISMA expert professors, from around the world, bring both their academic and practical experience to the class. In more recent times, the technology and engineering sectors have flourished, particularly in Berlin, the capital city, which makes it an exciting place for young graduates and professionals. RANKING: The MBA and the MIB are accredited by AMBA. The GGSB MBA was ranked by the Financial Times' 2016 Global MBA Ranking, among the top 100 Global MBAs worldwide, among the top 30 in Europe. The MIB was ranked 20th worldwide amongst Masters in Management and 8th in international career mobility. Berlin is a multicultural and lively city, with a rich history and a range of job opportunities on offer, particularly in the technology sector. The affordable cost of living and vibrant culture make it a popular destination for students. It's the second largest city in the EU and has a thriving business scene, offering a range of job opportunities to young professionals and graduates. In addition to its rich cultural and political history, it is now becoming famous for its wealth of flourishing tech companies and growing number of successful entrepreneurs. Almost a third of the city is made up of green space, with plenty of public parks and gardens available. The city has a complex and extremely efficient public transport network, with long-distance rail lines connecting Berlin with other major cities (and even other countries), and two international airports. GISMA's Berlin campus is located in Schöneberg, a lively district with good transport links and many beautiful green spaces. The neighbourhood surrounding the GISMA campus has shops, restaurants and cafés, so students will never be at a loose end. GISMA's Hannover campus boasts modern facilities, and is located close to the River Leine. The campus can be accessed by tram, a five-minute walk away. With the campus located in the city centre, there is great access to shops, restaurants, nightlife, museums and other attractions. Attractions such the Historical Museum, and the New Town Hall are all reachable within five minutes. The Maschsee Lake is close by, as well as the Eilenriede Townforest - the largest of its kind in Germany - that transforms the city into a green oasis. You can start your accommodation process at GISMA once you receive your visa and book your flight ticket. We will then allocate a place for you. After you send your application, you will receive an accommodation offer after a minimum of two weeks. Your offer will include: a description of the accommodation, local area, and costs (rent, deposits, accommodation fee, etc.). If you accept, you will receive booking confirmation - including payment details from your landlord. · Magellan MBA: The Magellan MBA programme will transform you into an effective and inspiring leader, no matter the industry you wish to work in. This program is delivered by, the award winning, Porto Business School, at GISMA. The Magellan MBA from Porto Business School is ideal for students who are looking for a truly international experience. Studying this course with GISMA will offer you a quality learning experience in the heart of Hannover. Classes take place in a friendly setting that allows a great deal of interaction between faculty and students. Teamwork is a key aspect of this programme, both in the classroom and beyond. Study modes: Full-time, Duration: 14 months, Hannover, Germany, Intake Oct 17, Fees: €25,000; flexible payment plans available. Successful applicants will have the chance to study an MBA from Porto Business School, accredited by the Association of MBAs (AMBA) and EFMD programme accreditation system (EPAS). Porto Business school was ranked 62nd by the Financial Times European Business Schools 2016.
Business Programmes: Our business programmes are designed around a precise academic and theoretical framework that will help you become an expert in your chosen field. This will allow you to apply for specialised positions upon graduation. · Grenoble MIB: GISMA's Master in International Business (MIB) is the ideal programme for those looking to acquire knowledge and refine their skillset in order to secure a professional management position after graduation. Covering a spectrum of disciplines, you will gain the skills needed for any number of business roles. Intake: September 2017 Fees: €22,000, limited scholarships available. Next intake: September 2017, Fees: €22,000, Limited scholarships available. · Grenoble MSc Innovation, Strategy & Entrepreneurship: The MSc ISE will give you the insight you need to become a creative and highly effective manager, whether it is in your own business or as part of a larger company. You will study a comprehensive management curriculum with specialised modules in innovation, strategy & entrepreneurship. The course is delivered jointly by GISMA and Grenoble Ecole de Management. Intake: September 2017, Fees: €22,000. Limited scholarships available. Marketing programmes: Our master’s degrees will provide students with the opportunity to acquire knowledge in various areas of marketing, develop strategic thinking, and leadership skills. Students will analyse the international business environment to produce effective, customer-oriented marketing solutions for a range of organisations. They will also develop managerial competencies through teamwork, leadership, and communication analysis. Information Technology (IT) programmes: Our programmes in IT are designed to ensure the confidentiality, integrity, availability, and authenticity of information in electronic forms to public and private resources and services in cyberspace. IT security professionals will study cryptography, system security methods, hacking tools, information security policies, computer forensics, and more. Human Resources programmes: Our programmes in human resources will give you practical expertise and teach you to scientifically analyse issues involving personnel and organisation, teaching you to think about them on a strategic level. You will also learn how to determine the ideal combination of HR practices to optimise organisational, group, and individual performance. · MSc Corporate Financial Management is designed and awarded by The University of Law and delivered at GISMA’s Berlin campus. The programme is delivered in an interactive way with a workplace focus. In addition to regular lectures and workshops, you will have access to a wealth of online resources from The University of Law, including case studies and video content. Intake: Oct 2017 and Jan 2018, Fees: €15,000.